As soon as the threat of frosts is past planting out can begin in earnest. Annual* bedding plants and tender perennials* can be hardened off by removing them from the greenhouse and placing them in a cold frame. Initially the cold frame will have to be covered at night, but gradually the cover can be left off so that eventually the plants will be ready to plant out in the open garden. It is always best to plant either in the early morning or in the evening. This lets plants take up water from the soil as well as minimising stress from the midday heat. Both Cannas and Dahlias will benefit from a generous mulch of compost as they are hungry feeders. Other plants, such as trees and shrubs, can also be planted but the roots need to be thoroughly soaked before planting. If the plants are given an occasional drenching over the summer rather than regular watering this will encourage roots to seek water for themselves rather than rely on frequent watering. Staking plants is best done before they get too large. To minimise staking some plants can be given a 'Chelsea Chop'. This is where the stems are pinched back by a third to a half of their original size. It produces a later flowering plant which is more compact and self supporting. This is normally done around the time of the Chelsea flower show - hence the name. It works well with plants like Phlox, Sedum, Campanula and Helenium. Rhododendrons and Camellias can be pruned after flowering. 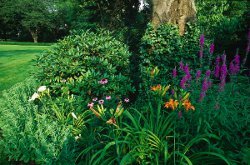 A light trim maintains a good shape, but mature plants that have outgrown their space can be pruned right back into old wood leaving a stump. This may look drastic but if the plants are given a good feed and mulch they will respond quickly. Keep on top of the weeds by hoeing in the morning and leaving the weeds to shrivel in the sun. Last of all, don't forget to admire your hard work and enjoy your garden. * Annual plants are those that germinate, flower and die each year/season. 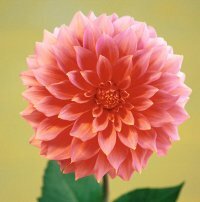 * Perennials are plants that last for several years and, once mature, will flower each year.